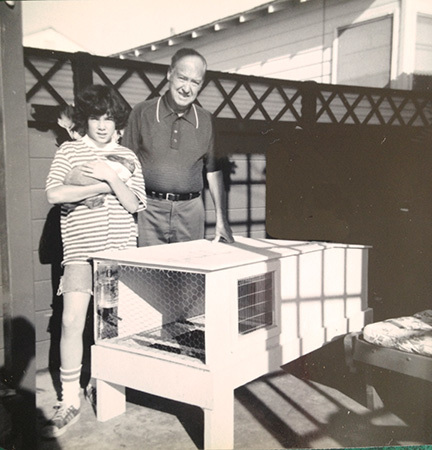 The year was 1975, and after the relatively short life of his second pet hamster, company founder Kevin Whaley — then only 12 years old—decided with his parents that a rabbit would make a better pal. After acquiring his first Dutch rabbit, he noticed a lack of any suitable hutches or cages on the market. With the help of his grandfather, a retired aerospace fabricator, they set out to build the ultimate hutch. 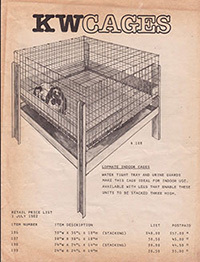 Soon, Whaley was building his second and third hutches and it wasn't long before family and friends wanted to buy the well designed enclosures. So, in 1976, he setup a small workshop in his family garage and production began after school and on weekends. His mom was his first employee. Little did he know his burgeoning cottage industry would eventually become his livelihood which would turn into today's global organization. Whaley enthusiastically raised all manner of critters whether they could hop, crawl or fly to learn about their vast and varying needs. He took high school and college courses that would enhance his knowledge of design and animal husbandry. Over the years he introduced many design ideas that made their lives healthier and happier and the keeper's job easier. 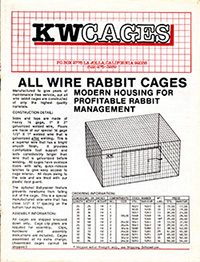 Now 40 years later, the original KW Cages has grown into KageWerks, Inc., a diversified manufacturing and marketing company with multiple divisions focused on specialized products to enhance the lives and experiences of animals and their keepers. In its 40th year in business the company continues to grow and was named on Inc Magazine's Inc 5000 list of fastest growing private companies in the United States. 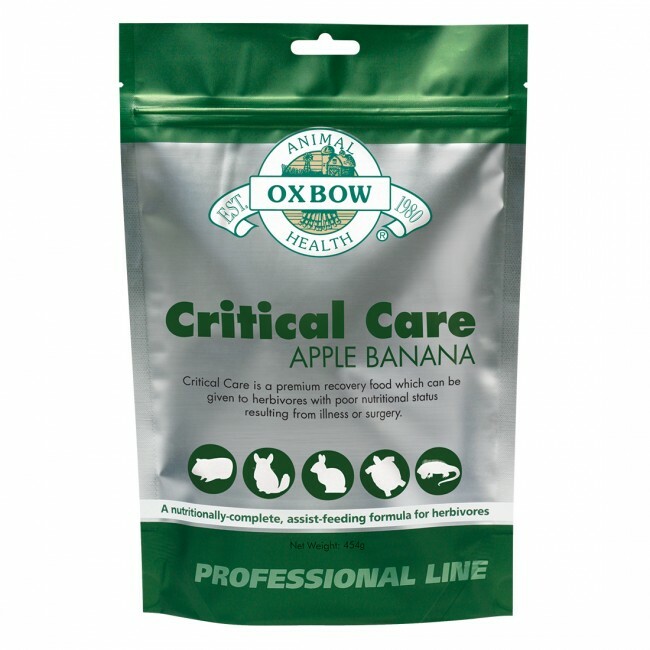 The nation's leading zoos, theme parks, animal rehabilitatOra, veterinarians, animal care facilities and humane organizations are regular customers. Many of the original customers, their children, and grand children continue to purchase products. 1976 Company founded in parents' garage. 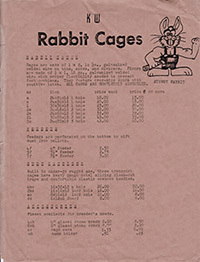 1977 First cages sold at county rabbit show at Del Mar fairgrounds. 1977 First illustrated price list is 1 page. 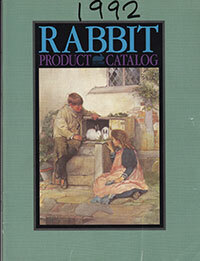 1979 First illustrated catalog is 8 pages. 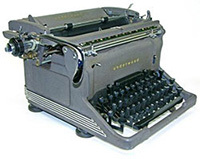 1981 First decimal stock list is created on parent's Underwood typewriter. 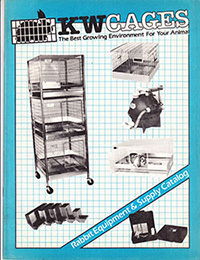 1982 Catalog grows to 12 pages and is passed out at Seattle, Washington ARBA Convention. 1983 Company exhibits at ARBA convention in Colorado Springs, Co.
1984 Catalog grows to 16 pages and company has 2 employees. 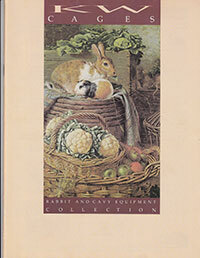 1985 Company introduces Litter Saver a product that has saved the lives of countless rabbit kits. 1985 Company moves from garage to its first 1,000 square foot "factory" in El Cajon, CA. 1986 Catalog grows to 24 pages. 1986 Company is computerized using Apple Macintosh computers. 1987 Many of the companies original advanced designs are created during this era. 1987 Company furnishes animal cages to Camp Snoopy at Knotts Berry Farm in Buena Park, CA. 1988 Company expands El Cajon factory to 3,000 square feet. 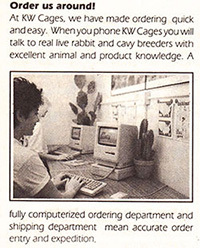 1988 Company introduces Hexagon Aviary, a best seller to this day. 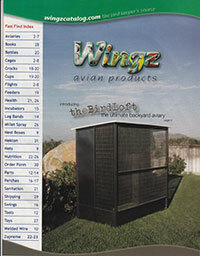 1989 Company launches Wingz Avian Products catalog showcasing aviaries. 1990 Catalog grows to 40 pages. 1991 Company acquires Nivek Corporation, a manufacturer of small animal automatic watering systems. 1991 Company introduces its first plastic wash down system (Rabbitech) at the ARBA Convention in Pomona, CA. 1992 Catalog grows to 52 pages. 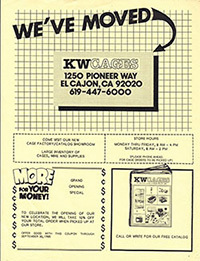 1996 Company opens Central California branch near Fresno. 1999 Company opens its first E-Store and digitized print catalog. 1995 Company purchases a 20,000 square feet modern tilt-up concrete factory on 1.1 acres in Santee, CA. 1996 Over the course of a month company moves into new facilities. 2001 Company celebrates 25th year in business. 2001 Company raises giant USA flag over sheet metal department as a tribute to lives lost in New York and Pennsylvania during the 9/11 terrorist disaster. 2003 Company acquires Motor Marker Industries line of Inkinators tattoo equipment. 2004 Company acquires SI Staloch's Industries a manufacturer of perforated rabbit feeders. 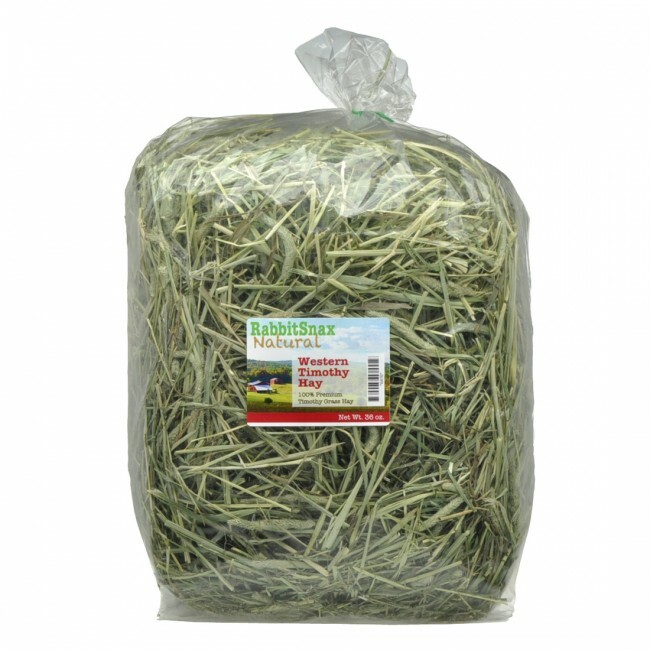 2005 Company introduces 3 level Rabbitech system. 2006 Company introduces new Flip-N-Fill water bottles from Nivek division. 2007 Company enjoys status as a preffered supplier to many major zoos. 2007 Company publishes first full color Wingz catalog. 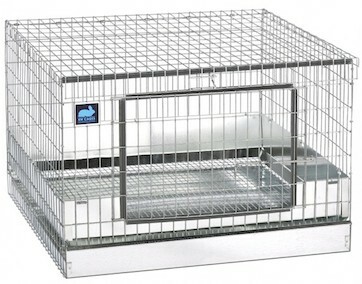 2007 company furnishes guinea pig cages for Walt Disney Picture's G-Force movie. 2008 Company introduces BirdLoft a weather-sheltered bird aviary. 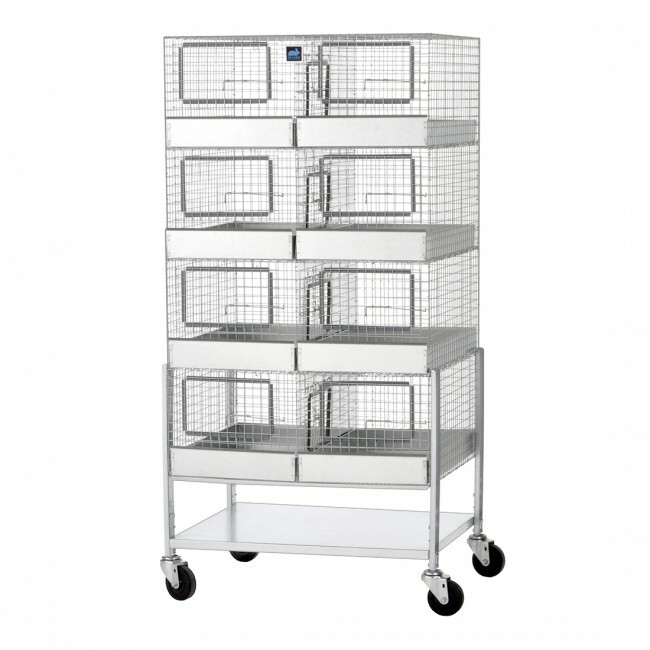 2009 Company introduces the Retro Carrier single rabbit transport cage. 2009 Company appears in live build of tiger enclosure for ABC TV. 2011 Company introduces Groom N Go groomer's table and storage case. 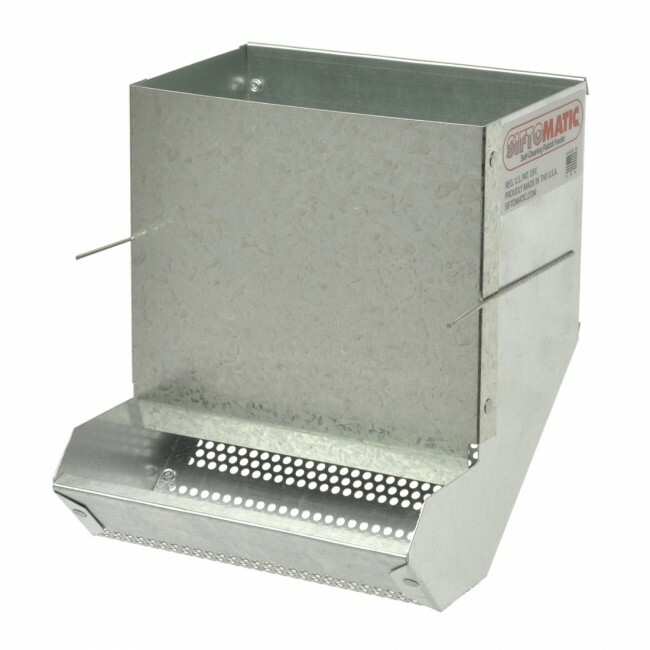 2012 Company registers Sift-O-Matic feeders with US Patent and Trade Mark office. 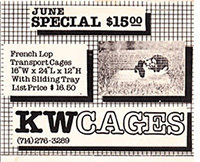 2013 Company introduces KW Flyers line of rabbit hopping equipment. 2014 Company expands and renovates outlet store. 2014 Company launches its all new ecommerce stores, kwcages.com and wingzstore.com. 2015 Company completes World of Birds aviary complex enclosure and training facility for major zoo. 2015 Company modernizes factory with state of the art metal cutting system. 2016 Company celebrates 40th year in business. 2017 Company continues 40th anniversary celebration through June.